It was never just about a group of kids becoming active participants in endless swashbuckling adventure: they also had to be projections of all our relatable childhood insecurities. When Richard Donner utilized this element of suggestion during the making of “The Goonies,” that precious morsel of insight was so thoroughly concealed behind an endless display of kinetic action and ambitious visual energy that few (if any) moviegoers were observant enough to detect it; it was as if he and his writer Chris Columbus devised one of the most elaborate hidden agendas of their time. Because casual eyes are often more enamored by the presence of relentless fanfare when they go to the movies, imaginations were directly inspired here to heights vast enough to sense peripheral possibilities waiting outside the camera frame, and for well over two decades that sweeping sense of joy persisted in the minds of anyone who dared to recall the great possibilities of youthful escapades. But when wonder fades from the senses and is replaced by the sting of individual being, what point does a movie about a gathering of silly kids searching for a pirate treasure have to say? To ask that question now is to reach the uncultivated center of Donner’s treasured intentions. 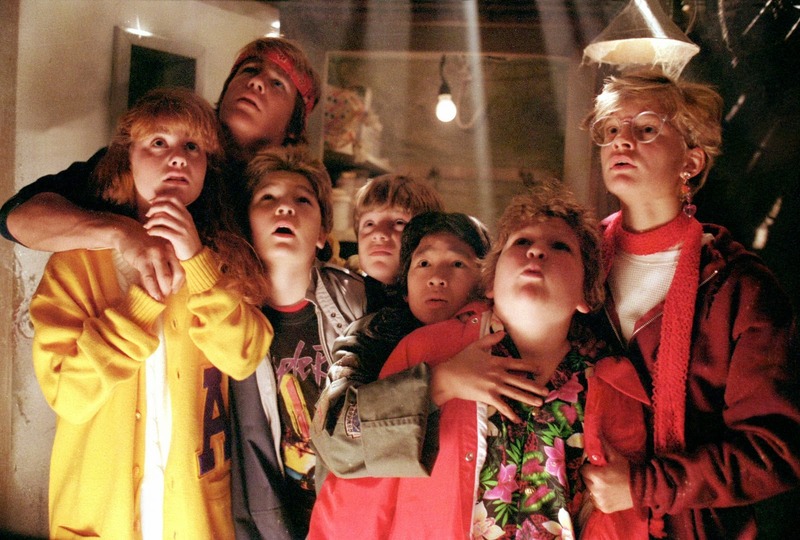 “The Goonies” persists as one of the great fables of young adult cinema not merely because it’s very skilled at what it does (even with its dated sense of production values), but because it weaves that magic into the minds and hearts of kids that serve as identifiable facets of our universal journey towards maturity. Nearly every indication that this ensemble of young bright faces was assembled out of mere coincidence seems almost fictional in a grand scheme of awareness, and our inclusion in their journey is intensified by the stirring notion that each of their quirks (or fears) is made obvious so that the narrative can use them for effective emotional development. For anyone who ever grew up with that same sense of internal displacement, this impulse seems almost too profound to be part of a movie with such jovial surface goals. Did Columbus and Donner arrive at that conclusion as a way to guarantee an ongoing future for their endeavors, much in the same way that the early Disney cartoons have allowed their characters to so effectively resonate? The answer lies in the notion that we continue to be drawn to it even now. There is a story here, even though much of it carries almost second-nature details. The movie opens during a moment of escape for an imprisoned felon named Jake (Robert Davi), who fakes a suicide and then walks freely out of the county jail to join his brother Francis (Joe Pantoliano) and mother (the remarkable Anne Ramsey) on an ambitious escape from legal authorities. A high-speed chase ensues over the opening credits, and the scenes are strategic in the way that the events casually cut into the routines of those who will go on to become critical faces during the rest of the film. All of them inevitably converge at the house of the primary hero: Mikey (Sean Astin), an asthmatic youth whose family is but one of several impending victims of home foreclosure in the Goon Docks neighborhood of a town by the ocean. All close friends united by their situation, they are brought together by the inevitability of their separation during one last weekend of celebration, and their unity is interlaced so thickly with the onset of personal loss that they mask their fears with all the typical youthful defense mechanisms, including practical jokes, biting sarcasm and incessant talking over one another, especially in crowded rooms. Why are all of them within days of losing their homes? Because a land developer intends to expand the nearby country club right into their community in order to take advantage of scenic ocean views, and the only way they can be stopped is with money – none of which any of them have. As they lumber through that reality, their need for one last adventure together seems to rouse their curiosity towards something forbidden. That outlet comes in the form of a trip into Mikey’s father’s attic, where an alarming discovery is made: a treasure map originating from the days of lawless pirates, indicating that a wealth of gold is buried somewhere in the cavernous cliff sides by the sea. Mikey’s older brother Brand (Josh Brolin) is not roused enough to think of a search as sound or rational (who is to say it is even real?, he argues), but the rest of them are not content to ignore their interest – mostly out of desperation to preserve their disappearing neighborhood. In a mad act of adult defiance, they rush off and begin an exciting journey into the hidden lairs of ancient swashbucklers, inevitably crossing paths with the villainous Fratelli trio during their deadly descent. What occurs to this cluster of adolescents involves some of the most absurd plotting seen of any film of this nature. As the journey progresses, it is clear that not a single thing going on to any of them is even close to being realistic or logical; even Indiana Jones would howl at some of their elaborate predicaments, which seem choreographed with almost magician-inspired precision (my favorite example: a scene in which one of the characters is required to play an organ made of human bones in order to open up an essential passage leading to escape). But that is not exactly the point of “The Goonies,” because it is one of those movies that depends entirely on the buy-in of its participants, not those seated in the audience. Columbus’ screenplay is remarkably audacious; he allows these people to wander into this perilous venture with every expectation of danger, and then exposes them to such alarming and unforeseen obstacles that they seem plucked out of a plot to some elaborate cartoon. Some of them even evolve into rather ambitious subplots, too. Consider what occurs to the character of Chunk (Jeff Cohen) as an example; when he is sent off on a wild chase to find the police and falls into a trap with the murderous Fratellis, they chain him in the basement of their hideout where he meets Sloth (John Matuszak), a deformed but muscular adult who takes a liking to him essentially because, well, they share a love of Baby Ruth candy bars. Most films would abandon this kind of character detour in favor of getting them right back onto the primary action highway, but so is not the case here. Because Columbus bothers at all to spend time with this added facet of story, he builds a relationship dynamic that is part humorous, part energetic and even part touching, and by the end both characters emerge as a critical tool in pushing the movie’s remarkable emotional charge. Adventure is nothing, after all, without joy and compassion dotting all the obligatory moments of tension, right? Now reflect on the relatable quirks of the ensemble as a whole, not just the primary players. The Mikey character embodies that quality of a child desperate to step outside of the shadow of his older (and more popular) sibling. Brand, in contrast, represents that moment of transition when young love is delicate enough to inspire one into the role of a loyal protector. Data is the Asian science nerd displaced by his cultural barriers. Mouth is a smart aleck who uses his biting oratory as a defense against some level of personal insecurity (Corey Feldman made a career of this shtick; he used it again shortly after in the brilliant “Stand by Me”). Chunk is overweight, outcast and often made fun of for it, even by those claiming to be close friends. And Stef and Andy – the high school girls who trickle in almost by accident – are not window dressing to provide female members of the audience something else to stare at; their interactions exhibit early traces of what may go on to become motherly instincts, and their nature to partake in the perilous journey with some level of cautious observation over others – either with charm (Andy) or with sarcasm (Stef) – adds narrative strength to their sense of teamwork. That their collective quests are contrasted by the antics of a trio of rather silly (but dangerous) criminals is not indicative of poor antagonist writing, but of highlighting necessary contexts. In a movie like this, the real villain is not a person or circumstance, but the looming threat of a trap that has the potential to lead many of them to tragedy, the greatest of which is the destruction of friendships. So much of the movie depends on adrenaline – and the unending conviction of one trap leading to two or three others – that it’s a wonder any face involved is able to stand back long enough to regain footing and establish individual identity. Donner, thankfully, is not content to just jump from one action sequence to another – although they do stack quite rapidly, especially in the latter half – and there are moments where the film pauses long enough to catch its breath to fuel the inspiration of the adventurers through rather poignant dialogue exchanges (should they go on and risk getting killed, or go back to a life that will all end on Monday?). Because they are each balanced with a certain level of internal consideration, it is easy for us to be so easily swept along in their antics too; since their survival through incessant booby traps and encounters with a band of gun-toting criminals depends on their very basic nature to unite and build one another, the movie provides an absolute perfect balance of sentiments. And all of it ultimately leads to a climax that is thoroughly rewarding (both visually and mentally), even inspiring one of the greatest moments in any childhood yarn: a scene when Mikey, enamored by his pursuit of the pirate ship’s infamous leader, shares a moment with the skeleton of his hero that is rather touching in the way it balances competitive success with decisive admiration. Here is a cutthroat swashbuckler who did everything in his power to thwart the discovery of his valuable treasure over countless centuries, and yet one is left with the unspoken certainty that even he would nod his head in respect at the kid who managed to bypass all of those dangerous traps. There is seldom a day that goes buy in which part of us does not reflect back on “The Goonies” without some sense of unending admiration. As kids we are overjoyed by the visceral nature of its many colorful action scenes, and the immense art direction – which leads to a spectacular reveal of an ancient pirate ship that seems more real than it should – is as believable as any of the more reputable blockbusters of that era, including the “Indiana Jones” pictures. If age deadens us to those qualities, then that’s where the film’s buried ulterior motives resonate; as adults, we are more observant to all the profound chords that the characters strike in us as individuals of hindsight, and suddenly all of those preposterous dangers in all those underground caverns take on an almost alarming sense of meaning. So much of the world around us is saturated in cynicism that there is little left to inspire wonder in our weathered hearts. How joyous to think that any movie – especially live action – can pull back all of those pessimistic layers and remind us, so many years later, that our experiences can still be easily shaped by the enthusiasm of eager storytellers, especially those farsighted enough to sense the enlightening nature of kids in search of some level of life-changing excitement.